Formero has successfully completed the prototyping of the outer skin components of a robotic exoskeleton designed to help people with disabilities walk. Rex, the robotic exoskeleton is a real-life pair of robotic legs that enables a person with disability to stand up, walk, move sideways, turn around, go up and down the steps as well as walk on flat hard surfaces including ramps and slopes. Rex was developed by a New Zealand start-up company called Rex Bionics, which employed the latest robotic technologies in developing this pioneering life-changing medical device for the disability market. Rex Bionics approached Formero to prototype the outer skin components, which covered the mechanisms of the device. Formero’s team faced numerous prototyping challenges with covers containing moving parts that were highly complex and which needed to be aesthetically pleasing, highly accurate and waterproof as well. Formero selected Selective Laser Sintered (SLS) additively manufactured parts produced from Nylon 11 for its strength and durability to prototype the covers of the ankle, knee, leg and hip joints. Secondary processes were also applied to improve the quality of the surface finish and overall appearance. The method of production changed from SLS to silicone tooling and vacuum casting as the requirements grew from a couple of units to over seven at a time. According to Chief Technology Officer, Richard Little, the Formero prototype team made it really easy for Rex Bionics to work with them. The exoskeleton medical device has taken seven years of development work and is now capable of supporting the full weight of a person. The design is simple enough for disabled users to self-transfer in and out of the device while a joystick and control pad are provided to operate the robotic legs. 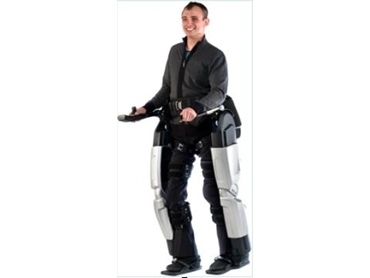 The robotic exoskeleton is available now in New Zealand with an international launch expected in 2011.